Just as Black Friday sales have ended, many retailers have now shifted to Cyber Monday deals on a range of Apple products. Apple authorized reseller B&H Photo Video, for instance, is offering some sizeable discounts on select 2016 MacBook Pro models. B&H offers free shipping and doesn't charge sales tax upfront on orders shipped outside of the states of New York and New Jersey. The largest discount is $1,000 off a high-end 2016 15-inch MacBook Pro with Touch Bar in Space Gray. The configured-to-order model is nearly maxed out, with a 2.9GHz quad-core Intel Core i7 processor, 16GB of RAM, 1TB of SSD storage, and AMD Radeon Pro 460 graphics. The sale price of $2,499, down from Apple's original price of $3,499 last year, is by far the lowest price we've ever seen for this particular model. B&H is slashing $900 off a mid-range 2016 15-inch MacBook Pro with Touch Bar in Silver. The model is equipped with a 2.7GHz quad-core Intel Core i7 processor, 16GB of RAM, 512GB of SSD storage, and AMD Radeon Pro 455 graphics. This deal is a flash sale, so supplies are limited and will likely sell out quickly. The sale price of $1,899, down from Apple's original price of $2,799 last year, is the best deal we've ever seen for this particular model. The base model 2016 15-inch MacBook Pro with Touch Bar can be had for $1,799 in Space Gray, which is $600 lower than Apple's original price of $2,399 last year. The model is equipped with a 2.6GHz quad-core Intel Core i7 processor, 16GB of RAM, 256GB of SSD storage, and AMD Radeon Pro 450 graphics. B&H offered a better deal of $800 off the base 2016 15-inch MacBook Pro in Silver on Black Friday, but supplies quickly sold out, and $600 off is still among the best deals we've ever seen for this particular model. While newer 2017 MacBook Pro models with Kaby Lake processors were released in May, the performance improvements driven by the small bump in base and turbo frequencies are relatively minor. For that reason, most customers will find these impressive deals on 2016 models worth considering. For customers who prefer the latest and greatest MacBook Pro, eBay is offering $270 off a mid-range 2017 model with a 3.1GHz dual-core Intel Core i5 processor, 8GB of RAM, 256GB of SSD storage, and Intel Iris Plus Graphics 650. 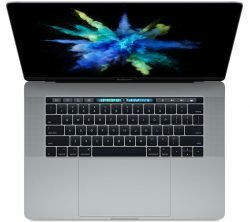 The sale price is $1,529.99, down from $1,799 on Apple.com. Supplies are limited. Apple authorized reseller Adorama is offering $250 off a higher-end 2017 13-inch MacBook Pro with Touch Bar in Space Gray. The custom configuration, now $2,249, is equipped with a 3.5GHz dual-core Intel Core i5 processor, 16GB of RAM, 512GB of SSD storage, and Intel Iris Plus Graphics 650. For additional deals on Apple products and accessories, including other MacBook Pro models, check out our Cyber Monday roundup. Disclaimer: MacRumors is an affiliate partner with B&H Photo Video, eBay, and Adorama and may receive a small commission if you click one of the above links and make a purchase. Not in this forum of grumpy old Apple dinosaurs. Say is ain’t so! Grumpy Old (Innovation Loving) Dinosaurs? No!. Blissfull(y ignorant) Affluent, Happy, Shiny Followers? Yo! Now. Hand the nice gentleman behind the counter your wallet and smile back. Awesome deals, but I’m sure people will have a problem with them. Great deals on LAST YEARS technology. This seems more like a liquidation sale of the 2016 MBPs cause they couldn't sell them when they came out. Even with these savings, glad I opted for a 2015 model. That MBP is still overpriced at $1000 off. The industry leading soon to be $trillion company who holds billion$$s in cash that really doesn't discount anything makes $hitty computers that are overpriced and only ignorant, yet extremely wealthy, fools buy. That is what I learned in a Cyber Monday Mac sale thread. and the quiet fixes and updates for the 2017. I wish we had some discounts even remotely like this in the UK.